Paper Pawz: MFT Happy Pawlidays for Butterfly Reflections! 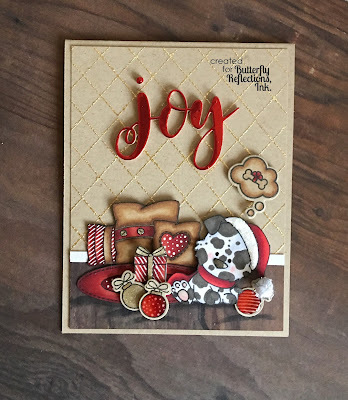 My inspiration for the project was the puppy from the new MFT Happy Pawlidays set and I colored the pup like my little BFF Duffy :) I then went through my MFT stash and decided to use the accessories (carpet and pillows) from the MFT Merry Christmoose stamp set. I stamped the accessories on Kraft card stock and colored them with my Copic Sketch markers. I then decided to opt for a Kraft background. For the background I decided that I wanted a wallpaper effect so I used the Lawn Fawn Argyle Background stamp with some Judikins sticky embossing powder to add some gold Nuvo gilding flakes. I then cut a piece of wood pattern paper for the floor. 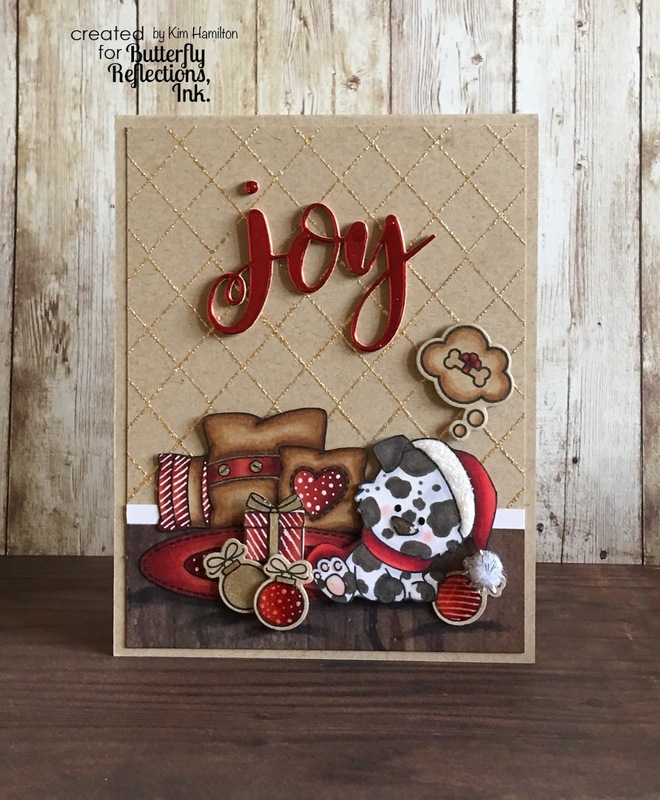 I placed my colored images on the background and decided I was missing some accessory elements so I stamped the ornaments and gift from the Happy Pawlidays set on Kraft, colored them and then used the accompanying dies. I fussy cut the other elements so they would be seamless on the scene but I felt that the dies for the ornaments was fine. I then embellished them with my white and stardust Gellyroller pen. I opted for the beautiful Joy die from the newest MFT release for the sentiment (love this die). 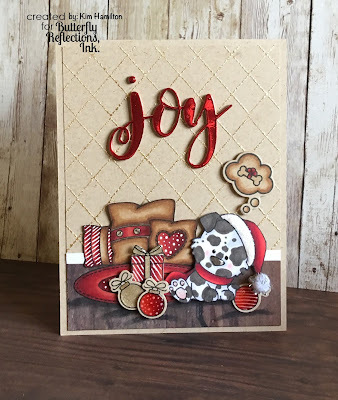 Once all of my elements were glued to the card base I really felt that the little "Duffy" needed the Lawn Fawn bubble with the bone from the Christmas Dream Stamp set lol! I then added glossy accents to the ornaments, the dogs nose and eyes and the buttons on the middle pillow. Thanks so much for taking the time! If any of these products interest you they are available a Butterfly Reflections Ink. If there are items out of stock simply press the notify me option. Vanessa is really quick about re-stocking!